In February 2013, the Curiosity rover became the first robot to drill into the rocks of Mars. The one-ton laboratory analyzed powder from the resulting borehole, and discovered clays and sulfate minerals, which form in the presence of low-acidity water. The conclusion? Curiosity was sitting on what was probably once a lake bed. These tantalizing results came from a borehole just five centimeters deep. What if we could go deeper? What secrets could we find by looking meters—or even kilometers—under the Martian polar ice caps? Or beneath Europa's icy crust, which harbors a subsurface ocean? That's the idea behind Planetary Deep Drill, a new technology built by Honeybee Robotics and sponsored by The Planetary Society. Honeybee has sent in-situ sampling equipment to Mars on four separate NASA missions. The Planetary Society recently teamed up with the company on PlanetVac, a regolith sampling and return system. With Planetary Deep Drill, Honeybee intends to fulfill one of the biggest needs for subsurface planetary exploration: lightweight, portable drills that pack enough punch to probe deep beneath planetary surfaces. One of the architects of Planetary Deep Drill is Honeybee’s Kris Zacny. Zacny holds one of the most unique academic credentials in the solar system: a Ph.D. in Mars drilling from the University of California, Berkeley. Conventional drilling systems, such as the kind used for oil and gas, require the continuous addition of heavy segments as the drill goes deeper into the surface. This method is impractical—if not impossible—for robotic missions to other planets. Zacny and Honeybee have an alternative: a drill just four meters long that can be lowered and raised via a Kevlar tether. The tether, which also provides power and data links between the drill and the surface, coils around a winch. As the drill burrows deeper, more tether can be let out. Planetary Deep Drill would be pre-assembled on Earth and sent to another planetary body atop a rover or lander. "It's sort of like a portable, track-mounted drill system," Zacny said. "You have a mast, and the mast collapses on top. When you're ready to drill, you lift up the mast to a vertical position, and you drill down." He adds that Honeybee has also looked at mission concepts in which the drill would be housed upright inside a capsule like SpaceX's Dragon. In that case, the drill could simply punch through the hull and heat shield, and begin tunneling into the surface. 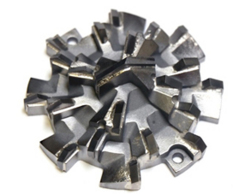 The Planetary Deep Drill bit is made from tungsten carbide, and is several times stronger than steel. 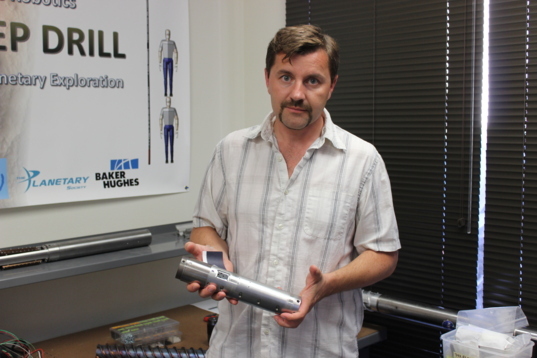 The 4-meter prototype drill is 6.4 centimeters in diameter. It contains all of the motors, electronics and sensors required to operate its tungsten carbide tip, which is much harder than steel. The drill is percussive, pounding like a jackhammer as it bores into ice and rock at more than 250 revolutions per minute. Inside the drill, an anchor section contains three gripper shoes that hinge outward against the borehole, providing stability while the drill works. Beneath that, a section called the Z Stage extends like an old-timey spyglass, lengthening the drill by 20 centimeters per drilling session. After that, the drill's auger is filled with shavings, and must be reeled back to the surface for emptying. The shavings can either be discarded or analyzed by other instruments aboard the surface spacecraft. A single drilling session takes about 30 minutes. Honeybee first tested the process in their Pasadena laboratory, before heading out to a gypsum mine near the Salton Sea in Southern California. Those field tests, which happened in 2015, sent Planetary Deep Drill dozens of meters beneath the surface. "We selected a depth at which the technology can be pretty well demonstrated," Zacny said. "It's not so deep that you have to spend a year in the field." The drill doesn't require much power, making it well-suited for missions to Mars or Europa. While the prototype is over-engineered for testing purposes, Honeybee's studies have shown the system can operate on just 100 watts. In addition to offering scientists a look at rock and ice samples from far below a planetary surface, Planetary Deep Drill is equipped with humidity and temperature sensors, as well as a microscope. The microscope is capable of imaging particles as small as 0.5 microns on the sides of the borehole. Honeybee is equipping the microscope with both white and ultraviolet lights. Zacny said the ultraviolet light is a bonus feature geared toward detecting fluorescence. Planetary Deep Drill is the first drill of its kind. “No one has done this kind of drilling in rock with this kind of approach," Zacny said. The Planetary Society is excited to support such innovative technology, with the potential to advance space exploration. You can help by making a contribution today.